Of all the things that have been under attack since Donald Trump took office—healthcare, the environment, the Clean Power Act, and minority and immigrant communities—the degradation of words has been one of the hardest for me to stomach. As a writer, I work carefully and to my best ability to ensure that the words I speak or type reflect my intentions. The intentional disrespect and disuse of words feels like a knife to the heart of the art and craft of writing itself. Of course, words in and of themselves have no meanings but are rather assigned meanings—by us, for us. They aren’t fixed over time—think of slang words like “cool,” or “bomb.” The meanings of words can be interpreted by different people in different times given their particular lens. And words, like the tools they are, can also be intentionally twisted. And it’s not only words, but phrases whose meanings have been slyly reassigned. For example, think about the phrase “over-prepared.” In the past, a candidate who “over-prepared” might have earned respect. After all, don’t we want someone who is asking to take the highest position in the land to have thoroughly done their homework? But Trump changed the meaning of “over-prepared” so that it would embarrass or weaken Hillary, making her need for preparation seem more like a handicap or a disconnect with reality (hence her need to prepare). In previous elections, Trump’s lack of policy knowledge, or even interest in studying up on policy, would have been the end of him. But it was spun by pundits and Trump himself as “spontaneous” and “fresh” and “instinctual.” And who could forget the nicknames that will forever stick: “Crooked Hillary,” “Lyin’ Ted,” “Low-energy Bush,” and so on. Words have divided into camps the same way our country is. Words have been politicized. Words have been sharpened. Words have been weaponized. And some words have been intentionally villainized. Chances are, the words on the left feel weaker, less active, less seen, less impactful, less…shall we say, Trump-like? And here is what is important to note: the list on the left are words commonly associated with the yin or feminine archetype (note: an archetype is an energetic pattern, not directly associated with gender). The words on the right, on the other hand, are more closely aligned with the yang or masculine archetype. In finding balance, whether in a person or in a society, it is important that we strike a balance—between yin and yang, feminine and masculine, receptivity and activity—regardless of which gender we conform to (or not). It is in this balance that we become whole human beings. 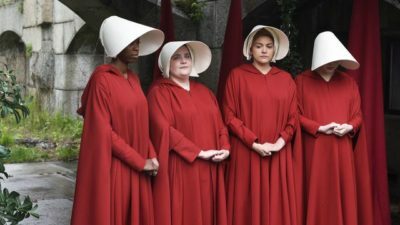 Even so, we are still a far cry from the degree of misogyny shown in The Handmaid’s Tale, for instance. But retraining a culture to diminish the feminine takes time, and must begin somewhere. 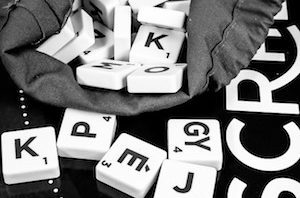 Beginning with degrading the language—particularly the language of the feminine the archetype—is an early but dangerous step. Negative implications upon the archetypal feminine will, if left unchecked and unchallenged, move to affect the real feminine, in body, in mind, in spirit. It will affect us, our moms, wives, sisters, and friends. And yes, it will impact our dads, husbands and brothers who must also be also allowed and encouraged to express the archetypal feminine in their lives. But this word of warning ends with one of hope. No one person owns and controls the meaning of words. To make change in this world for the better, we must promote the words on the left as strong, and not allow them to be portrayed as weaknesses. We must begin by each of us, man or woman, reclaiming their feminine power. Here are just a few simple, every day ways we can do so. Do not apologize for showing patience, tolerance, or extra kindness. Rather, show more. Kindness is a contagion; those in power know it, those of us can employ it. Do not let someone call you naive for displaying trust or open arms in this world. True naiveté is more of an unconscious state of not knowing. It is not the same thing as a conscious choice to show openness. Do not allow your compassion for others to be tempered by fear of being called soft. Compassion, true compassion, means to share along with (“Com” = “with; “Passion” = “pain.”) Those willing to step into someone else’s shoes and try to see the world as they do is a great act of courage and shows profound strength of soul. I think history will show us that we are now at a crucial turning point. After all, cultures are preserved through the skillful employment of words. Therefore, we must not allow anyone to weaken the very words that have the most power to radically change our world for the better. Instead, let’s take them back—own them, ignite them, and unleash HER, the archetypal feminine back into the world. This entry was posted in books, compassion, current events, earth, feminism, healthcare, patriarchy, Writing. Bookmark the permalink.